They look identical. 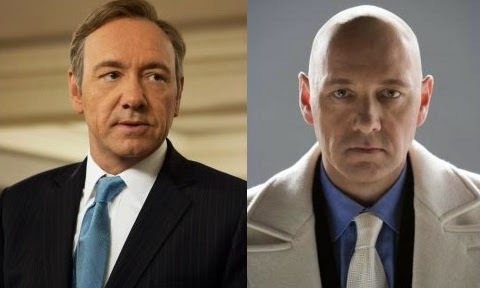 Both Lex and Frank are the same age, same height, have the same facial features and have the same voice. The only difference between them is that Lex Luthor is bald, and a wig is hardly a complex disguise. Lex Luthor wants to be President. In the comic books and cartoon, Lex works towards this goal as an attempt at gaining power over the world and Superman. But the Lex Luthor of the film world is a known criminal. He could hardly run for office... but he could if he was a politician called Frank Underwood. Lex Luthor owned a kryptonite ring that he used to protect himself against Superman. He later gets rid of this ring as he realises that the radiation given off by the ring was slowly poisoning him. Frank Underwood also owned a precious ring - his college ring - that he later buried for no reason. Could this be his kryptonite ring? In both the films 'Superman' and 'Superman Returns', Lex Luthor's plans revolves around property development. Frank Underwood is similarly obsessed with property, stating once that "Power is a lot like real estate. It's all about location, location, location. The closer you are to the source, the higher your property value." Even as President, he cannot stop thinking about property schemes. Frank and Lex share a certain unique trait: both of them enjoy publicly stating their plans to an unseen audience in villainous monologues, clearly talking about their innermost thoughts out loud. Whether it is Lex Luthor explaining to himself how his latest plan to kill Superman works, or Frank explaining to himself his latest political scheme, it can't be a coincidence that two similar characters also have this predilection. Lex Luthor hates Superman for standing above mortal man. In season 3 of House of Cards, Frank spits on a statue of Jesus, betraying his hatred for a super-powered individual. Both are expert manipulators, callous men with no compunction about killing those in their way. Both are geniuses, with access to wealth to further their goals. Both are evil men.